The augmented-reality star viewer, Universe2go, shows people, who love to observe the stars, the night sky in a very different perspective. Additionally, the device offers up interesting information to a variety of celestial objects. An astronomer could say, ‘That’s a fun little toy, but how can such a gadget be beneficial to me?’ The answer is a very clear: a lot. Even astronomers can value what Universe2go has to offer. Such a statement is not just an assumption either, since Universe2go has been tested over and over again by people, who occupy themselves with astronomy. Such reviews and experiences can be found at the Life, Unbounded blog at Scientific American and David Reneke’s website, or check out well-regarded astronomy author, Rod Mollise’s Astro Blog. The how and why of Universe2go’s utility to even seasoned astronomers are topics that we have summarized for your reading pleasure today. Universe2go features a large variety of details concerning the night sky. The complete Hipparcos Catalog with approximately 120,000 stars is included in the app. Messier objects as well as the complete NGC catalog round out a collection of celestial objects, which will enthrall even experts of Astronomy. 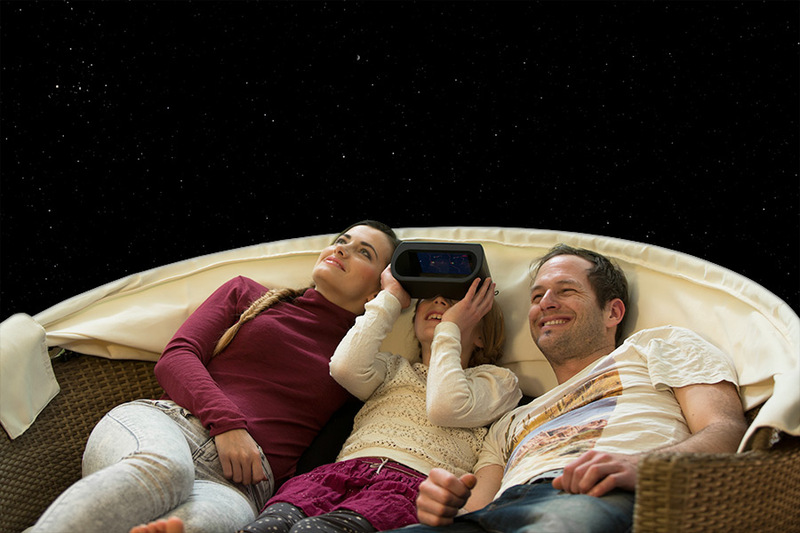 Universe2go offers – in contrast to virtual reality glasses – the possibility to view the real night sky instead of viewing a screen. The objects viewed through Universe2go are directly coupled with information in the app, providing digital zooms of planets, star clusters and galaxies – images which were captured by the Hubble Space Telescope among others. This feature allows the user to observe objects up close, which otherwise are difficult to see with the naked eye or a telescope. Astronomers prepare themselves often for night time observations in advance, since such preparation can ensure the best observation experience. With Universe2go, you can push aside intense preparation and be sure that you are ready anyway. Since the star viewer can be used during the day, so to speak as a Starmap, you can figure out which objects are visible prior to embarking on a stargazing adventure! This feature simplifies the planning process and offers a taste of things to come as well as heightens the anticipation of seeing specific objects at night. A significant feature of Universe2go is its Audio Guide, which contains additional information and descriptions of all 88 constellations, 120 deep-sky objects, planets, stars and satellites. Even if the every-day expert astronomer knows more about the night sky than others, the Audio Guide provides a wealth of information, nevertheless unbeknownst to such an experienced stargazer. Mythological background stories, the discoverers of constellations, or even the year of discovery are among the features to supplement the simple observation. Of most notable mention is Expert Mode, which guarantees only the desired explanations. In this mode, you can activate or deactivate individual settings, to specify which information to which objects are displayed. Last but not least: seasoned astronomers can put Universe2go to use, in order to bring family members and friends closer – even if those friends and family can’t recognize or orient themselves in the night sky, or don’t have the patience or time to study the cosmos. Wouldn’t it be nice to share your passion tonight?